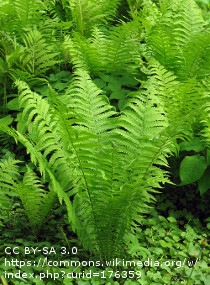 A beautifully symmetrical deciduous fern with broadly lance-shaped, dissected, pale green sterile fronds up to 4ft (120cm) or more. In late summer, shorter lance-shaped dark brown fertile fronds appear and these persist over winter. Grow in moist shade, a damp border or at the edge of a pond. Height 4-5ft (120-150cm), spread 3ft (90cm).